Rohit Khilnani feels Delhi Safari is a must-watch. Though many Indian studios have tried their hands at animation in the past, Delhi Safari reaches the closest to a good quality 3D animation entertainer. 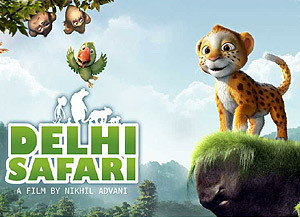 Kids, who enjoyed the Madagascar series and even Jungle Book, will enjoy Delhi Safari because there are a lot of things in the film they can relate to, like the popular Sanjay Gandhi National Park in Mumbai, names of other Indian cities, Hindi movie dialogues and even the mention of the popular Indian news channels every now and then. Delhi Safari, directed by Nikhil Advani is a joy ride that will take you on a fantasy trail from Mumbai to Delhi. It also sends an important message of protecting animals, a message many NGOs and government agencies are finding hard to spread. And this is where the medium of cinema does the job best. The story that starts at Mumbai's National Park where a builder encroaches in the forest to construct a housing complex, promising homes close to nature. The close proximity to nature obviously comes at the cost of cutting trees and even killing animals. Thus starts the journey of a leopard, her cub, a monkey, a bear and a parrot for justice. They decide to take on the builder by going to New Delhi and protest in front of the parliament in the presence of the media. Despite the predictable song-and-dance and even the story, Delhi Safari works as the train journey from Mumbai to New Delhi has a few of stops and fun moments that fit well into the plot. Funny as it may sound, Govinda's voice for Bajrangi the Monkey is just perfect. The actor, known for his comic timing makes you laugh even with his voice. Boman Irani as Bagga the Bear also works well as you can make out that the actor has put in effort to perfect the many moods of the bear. Suniel Shetty and Urmila Matondkar as male and female leopards and Akshay Khanna as the talking parrot are not bad either. Although the songs in the film do pop up more often than needed, the film, overall, signifies the progress Indian films have made in the animation genre. The animation team at Krayon Pictures and the writers Nikhil Advani, Suresh Nair and Girish Dhamija deserve a pat on their backs for the sincere attempt they put in making Delhi Safari a fun film.